A mille-feuille, otherwise known as a custard slice or Napoleon, is a traditional French pastry. 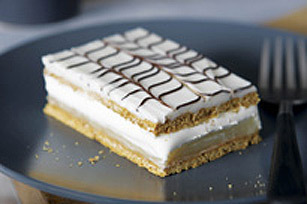 We've simplified the classic dessert recipe using vanilla pudding, graham wafers and whipped topping - our Graham Wafer Mille-Feuilles recipe is a must-try! Beat pudding mix and milk with whisk 2 min. Refrigerate 5 min. Arrange 15 wafers on bottom of 13x9-inch pan; cover with layers of pudding, Cool Whip and remaining wafers. Refrigerate 3 hours. Melt chocolate as directed on package. Spread frosting over dessert; drizzle with chocolate. Spoon melted chocolate into resealable plastic bag. Snip small piece off bottom corner of bag. Squeeze bag to drizzle chocolate in 1-inch parallel rows over top of dessert. Run toothpick back and forth through chocolate in opposite directions to create the traditional mille-feuille pattern.